Who doesn’t love moorish patterns? Lately I’ve become obsessed with them and want to create anything I can with these prints. That’s when the idea of a throw pillow hit me. Unfortunately the local stores didn’t carry any such fabric and everything I found online was expensive. That’s when I came across the Martha Stewart Crafts™ Arabesque Laser-Cut Stencils. I had some left over fabric from my IKEA MERETE curtains in the guest bedroom. And two 20 x 20 silk down pillows that I bought from Marshalls years ago on clearance for $5. Thanks to a few puking sessions when the kids were babies the silk covers were pretty worn out. Time for a facelift. Stick the fabric down onto your surface with painter’s tape. I was doing it on my carpeted floors. So I laid down a plastic drop cloth on the floor and taped the fabric to it. Start from a corner, lay your stencil down, and secure ends with tape. Make sure to start your pattern with some overlap to the side (looks more natural than starting with a correct edge). Mix 2 quantities of paint to 1 quantity of fabric medium in a disposable plate (I used a cough syrup measuring cup to measure out the exact amount). Lightly load your brush with paint, dab any excess on the sides of the plate, and tap away at the stencil lightly. Once you are done, lift the stencil gently. Line up the markings on the side of the stencil to your previous pattern and keep going till you’ve covered your entire fabric. Wipe the back side of your stencil clean after each session. Let it dry for 24hrs and then heat set the paint. 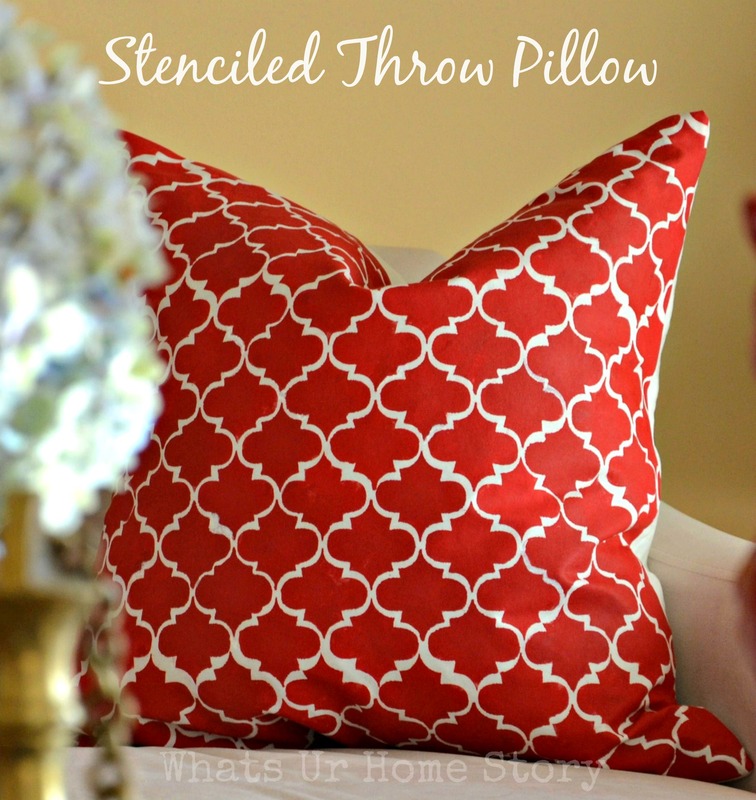 The pillow is your usual envelope pillow where the you take 8″ inches extra for the back half of your fabric, cut it into two halves, stitch seams, lay everything with the good side facing each other, and sew. You can get the detailed steps here. Once you are all said and done you’ve got your own Moorish stenciled pillow.All for $7.64 for one pillow. A few things to keep in mind; try your best to align the stencil properly. There might be cases where you mess up. Don’t panic. Once you are done stenciling the fabric, take a thin paint brush and paint the missing lines (I used white craft paint that I had, mixed with the fabric medium in a 2:1 ratio) like this. Can you even make out where the fess up was? The possibilities with stencils are endless. Happy pillow making! Wow. Great job! 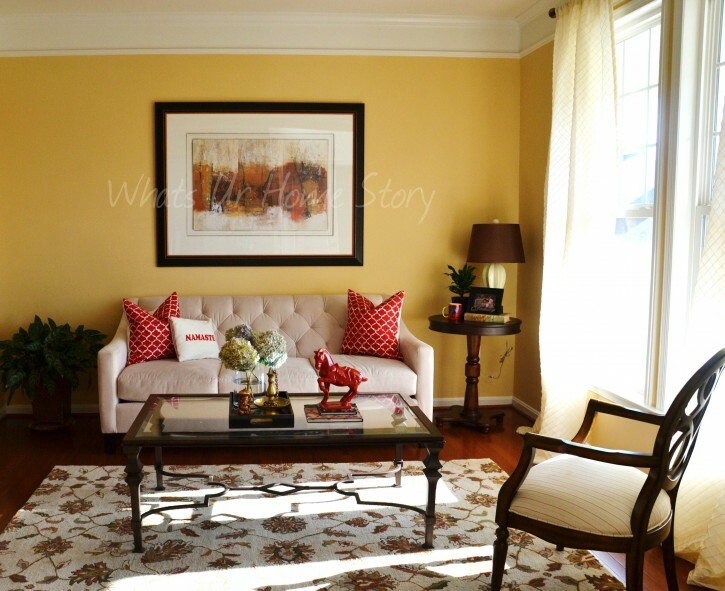 Love the quatrefoil pattern. I love, love, love this! I am a sucker for anything in a trellis/moroccan style geometric print. I didn’t even know MS made stencils… so checking that out next time I get to a Michaels. Thanks so much for sharing at our Keep Calm & Link Up party. Hope we see you again this Thursday! Are you from Alberta? I just saw my friend’s pics on FB of her trip to the Banff national park. Drop dead gorgeous place! You are so lucky to live close by! What do you mean by * then heat set the paint. – Step 7*….Planning to do my first stencil paint….. The fabric medium will have instructions on it to heat set. Basically once the paint is dry you iron it at the recommended fabric setting. Do let me know how it goes. Can you wash these pillowcases? Yes you can wash them. No problem at all. Wow!! Love this , I want to try this and it will be my first DIY project. Can you tell me where can I buy the plain fabric for the pillowcases. I live on budget and your ideas can help me do more DIY stuff! Vidya your website looks amazing and love love your creativity! Thank you so much for sharing them.Please reply, am hooked to your website . Thanks a ton Deepthi. You can try JoAnn’s and get a slightly thick fabric (so that it will absorb the paint). Would love to see what you end up making. Do you remember the name of the red Martha Stuart paint you used? It looks amazing? I still have the bottles in my basement. Will look it up and let you know. Thank you. Loved your site. Loved all your ideas. I am trying to paint a wall with some sort of Bandhani print. Any idea how should I approach it? It not a residence but a business so trying not to spend too much time on it. HELP. Just catching up on all comments now Vinita. A friend of mine hand painted a madhubani mural on the wall in her guest bedroom. Do you have something like that in mind? If so I can ask her to take some pics and send to you. Let me know.